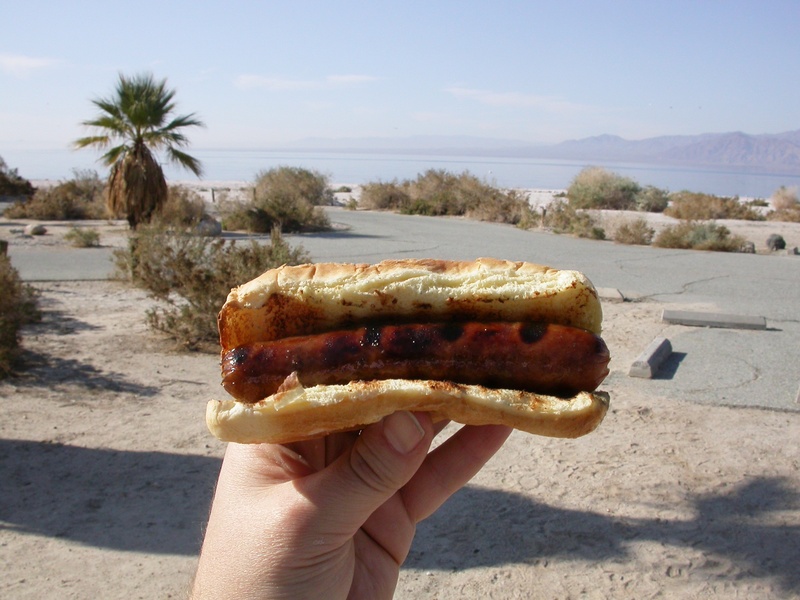 Saturday night London and I went camping at the Salton Sea, and I took another stab at a Messier Marathon. I did basically zero prep. I didn’t even think about checking the weather to see if camping was possible until noon on Saturday. Normally for a marathon attempt I have custom charts and checklists printed and I’ve been boning up on the positions and IDs of all the Messier objects for a few weeks. This time, nada. I have a laminated card with all the Messier objects plotted that I keep on my clipboard, and I took along Harvard Pennington’s The Year-Round Messier Marathon Field Guide (which everyone interested in deep sky observing should own), but my object checklist was handwritten because we don’t have a printer at home and I didn’t have time to go find one. That pretty much tells you all you need to know about my level of readiness. I was rolling with new kit this time. In fact, I’ve rolled with different kit every time I’ve attempted a marathon. In 2010 I used my XT6, which was still my biggest telescope at the time. For my first attempt in 2011 I used “Stubby Fats”, a 5″ f/5 reflector I sold last year. For my second attempt in 2011 I used the XT10, which is still my big gun. Oddly enough, I didn’t make a marathon attempt last year; I can’t remember why not. Yes, that is an eyepatch hanging from the SV50. 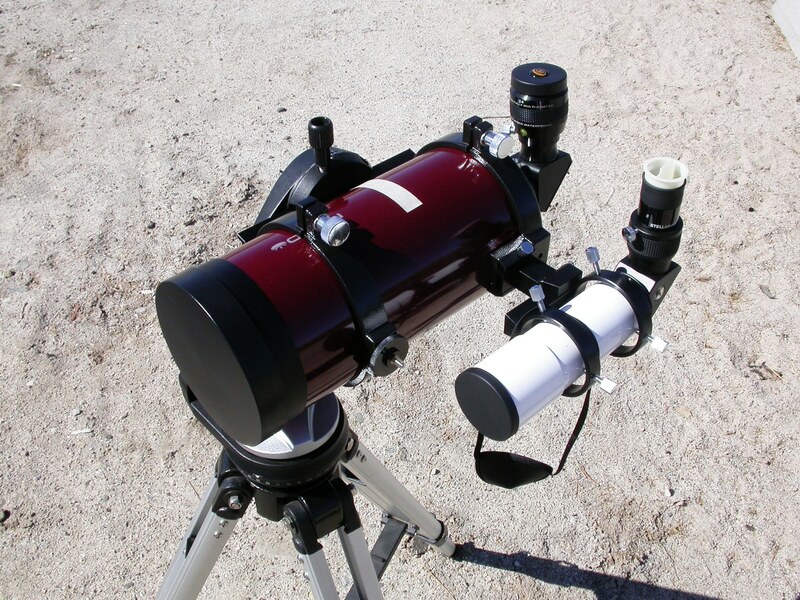 This time I used my new tandem rig: my Apex 127 Mak with my SV50 refractor mounted alongside as a deluxe finder. This idea, of having a small rich-field scope mounted alongside a planet-killer, has been a gleam in my eye for a while. I toyed around with DIYing it, but the whole point was to get a rig that Just Works. My adventures in ATMing having convinced me that while some folks can build things that Just Work, I get that level of performance from someone else’s quality control. The first component was a set of 144mm inside diameter tube rings to hold the Apex 127 OTA. That let me rotate it so the finder dovetail faced straight sideways. The second part was a set of actual Stellarvue finder rings. These are crazy nice–the adjustment screws are metal, but with little nylon inserts at the tip so they won’t scratch the telescope tube. 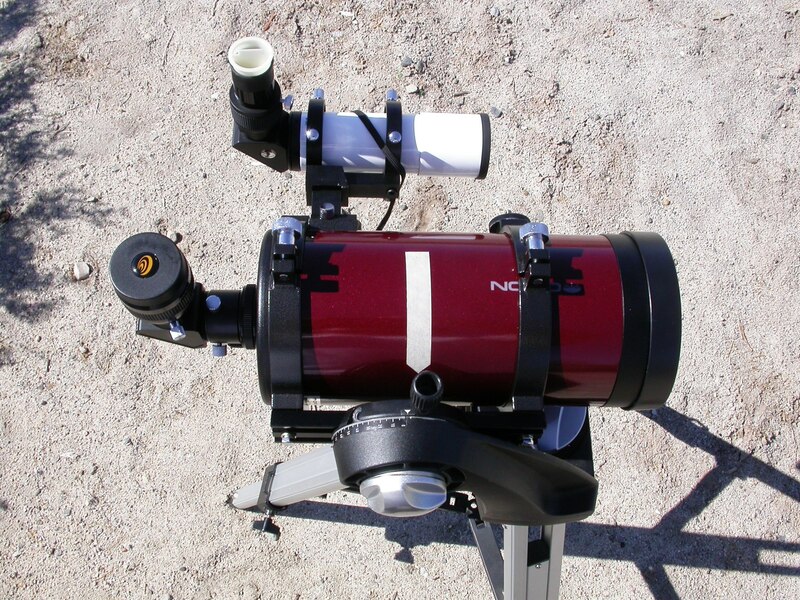 I got this all assembled last year, but right at the end of my fall observing season, so I only used it once, which was the Oct. 20-21 Salton Sea run with David DeLano. Although I haven’t blogged about before now, I have actually gotten out a couple of times this spring, and so far I’ve been using the Apex 127/SV50 setup exclusively. I’m sure the XT10 isn’t out of a job–it can still pull down four times as much light as anything else I own–but the tandem rig is so convenient and flexible that I think it will probably be my default observing setup for the foreseeable future. The evening rush was a little stressful. Partly because I was rusty and I knew it, partly because I was worried about the weather, and partly because we were hungry. On the weather front, it was cool and cloudy here in Claremont and indeed all over southern California on Saturday morning. Weather Underground was predicting that it would clear off at the Salton Sea, but only just in time for nightfall, and I have seen things get foggy there fast. Happily the clouds did open up as we drove past Cabazon and out of the LA basin, and by the time we got to the campground there were just a couple of small stragglers left. I was hungry because in keeping with the rest of the late decision to go and near-total lack of planning, we got to the sea just as it was getting dark, so we didn’t have time to get dinner on before I had to go catch the early-evening objects. I wasn’t so worried for myself, but I felt bad making London wait on dinner while I tried to track down faint fuzzies. Fortunately we had some snacks along to tide him over, and he’s pretty self-directed when he has free time and room to roam. In the actual event, though, I did get all of the evening rush objects. The toughest were M110 and M74. M110 was tough because I’m not still not used to the upright-but-left-right-reversed view through the Mak, and it took an embarrassing amount of faffing about to find it. M74 is legendarily tough: a fairly faint galaxy that is the closest Messier object to the horizon during the spring marathon season. I did finally find it, thanks to the detailed finder charts in Pennington’s Field Guide, a lot of looking, all the dark adaptation I could muster on short notice, and strategic ue of averted vision. I finally spotted an extremely dim glow, but I couldn’t hold it even in averted vision. I noted the position of the suspected glow with respect to some field stars and switched eyepieces. I fine-tuned my aim, looked away from the target point, and caught the glow in the same spot in averted vision. That’s all I needed. By 7:40 I’d caught the eight evening rush targets and bought myself some breathing room, so I knocked off for a bit. London and I cooked some hotdogs over the campfire and got our camp arranged a bit more satisfactorily. We’d pretty much just been throwing stuff around when we first arrived, so I could get set up and start logging objects. My second session was short but extremely productive: between 8:36 and 8:52 I logged 17 objects. After a short break, I nailed M52 at 9:06, and bought myself a long break. Time for toasted marshmalllows, s’mores, and curling up together in the lounge chair to look for shooting stars and tell stories. 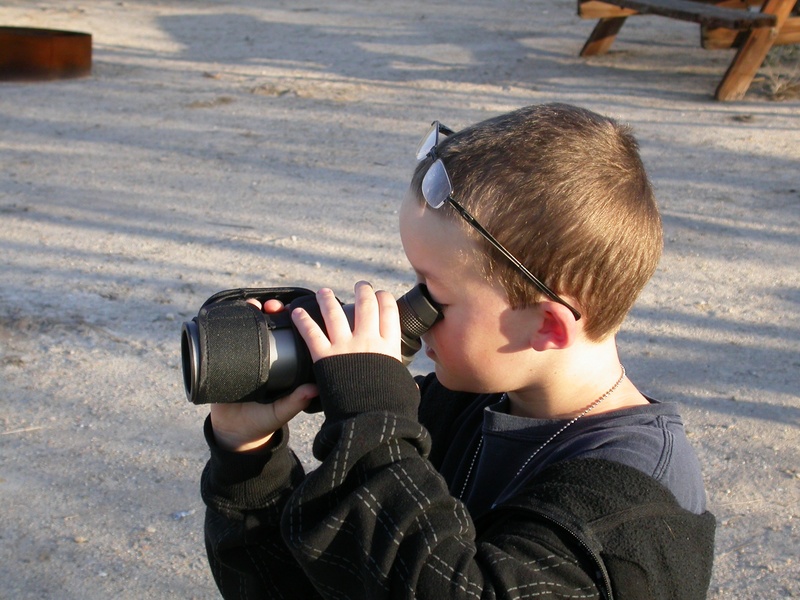 London with the Orion 20×50 compact spotting scope he got for his birthday. More on that scope in a future post (but if you’re impatient, it’s solid). London sacked out a little after 10:30 and I got back to work. There were really only three notable mid-game events. First, it took me 17 minutes to get through the 16 galaxies in Virgo and Coma using only the scope–one more minute than last time, when I used only binoculars. Second, at some point in the early morning I got my first look at Saturn this year. The seeing was rotten, but it was still breathtaking. Third, a little after three I noticed that Centaurus was over the horizon so I grabbed the binoculars and swept up Omega Centauri, by far the largest of the Milky Way’s known globular clusters, which is atmospherically dimmed at this latitude but still a majestic sight. Except for a couple of shortish breaks, I was observing pretty steadily from about 11:15 to about 3:45. I pushed much farther into the morning rush objects than I usually do before I took my siesta. When I knocked off at 3:40, I had 104 objects logged, so I was already in personal best territory (my previous record was 103, from late April, 2011). I figured I could afford 45 minutes of rest while the last few objects crawled over the horizon, so I set my alarm for 4:25 and got flat. As usual on marathon siestas, true sleep eluded me, but I did at least drift a bit. Aye-yi-yi. Somehow I always underestimate just how brutal the morning rush is. When I got up and got myself sorted, my first target was M15, which was dead easy. M75 didn’t put up much of a fight, either. But then I went into Capricorn, after M72 and M73. M72 is a glob, like M75, and theoretically it shouldn’t have been that hard, but no matter what I tried I just could not see it. Maybe the atmospheric extinction near the horizon was just worse than I thought, because I had the scope bang on the exact spot, but there was nothing in the eyepiece. At 4:50 I noticed something alarming: the sky was getting noticeably brighter in the east. Not good! I popped down to M73 and got it easily. Then I started trying for M2, which was right behind a palm tree, so I started waltzing the scope around in what was now obviously getting on toward dawn. Fortunately M2 is pretty bright and it was an easy catch at 4:57. It was also my last catch. I did one last scan for M72 and took a token pass at M30, but neither were showing, so that was that. I ended with 108 objects. I logged 72 objects only with one or both telescopes, 19 with binoculars only, and 17 with both the bins and one or both of the scopes. How do I feel about the outcome? Well, there is no question that I could have logged M15 and M2 earlier than I did, which would have left more time for M72 and M30. Maybe if I hadn’t felt rushed I could have brought the full suite of techniques to bear on M72 that I did on M74, but the fact is that I was in a hurry and scattered and just less methodical. Whether that would have helped or not, I don’t know. It certainly woulnd’t have hurt, but I seriously wonder if the sky conditions were good enough. March 9 is pretty early in the season for a marathon–according to Harvard Pennington, the very best chances are new moon nights between March 30 and April 3, which obviously don’t happen every year. This early in the season, all the evening rush objects are higher in the sky and therefore easier, but the morning rush objects are lower and therefore harder. (How much difference does that make? Well, there are 12 months in a year, so if I try again next month, everything will be 1/12th of the way around the sky, relative to the sun, from where it was this weekend. That’s a lot of celestial real estate.) I think M30 was probably impossible, this early in the season and given the imperfect near-horizon sky conditions–but I’d kill to have gotten on target for a try before the brightening sky made it a definite impossibility. Still, I am pretty darned happy. I missed getting the full slate of 110, but I didn’t miss it by much, and 108 feels much more like Messier Marathon success than 103 did. 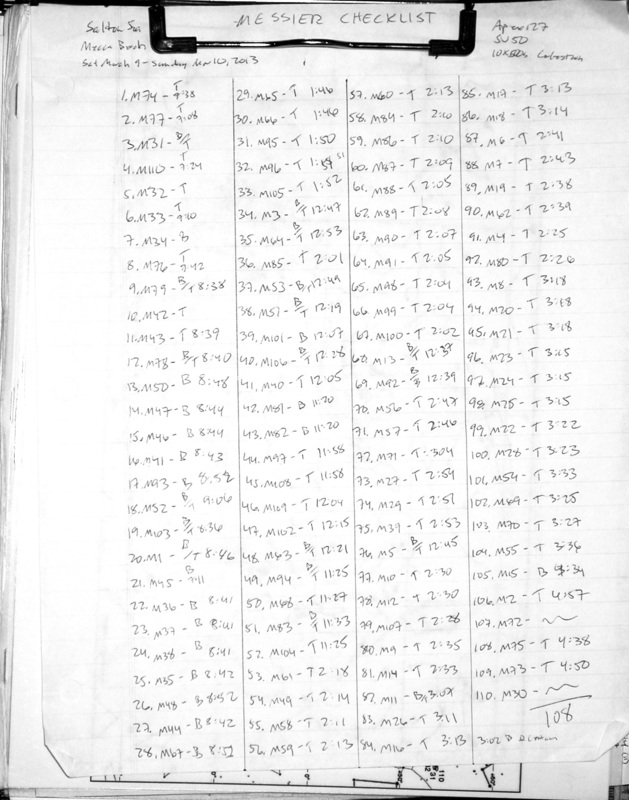 Heck, the guys who invented the Messier Marathon were stuck at 108 for a year (1979) and then 109 for several years before they finally sealed the deal in 1985 (for more about that history, see Pennington’s Field Guide and this awesome page). I feel like I’ve graduated into the ranks of Marathoners who have only been beaten by the legitimately gnarly nature of the quest. And I’m spoiling for a rematch. April 6 will be close enough to new moon as makes no difference, so if the weather is good, maybe I’ll get another crack at bagging the whole enchilada. The tape stripe marks the balance point of the whole rig with eyepieces and without lens caps, so I can mount it correctly every time. I used binoculars a lot less this year than in previous marathons. That’s down to two things. First, I forgot my 15x70s, so I was rolling with the old Celestron 10x50s that I now keep in the car on a permanent basis. They’re fine, they just don’t pull in nearly as much light as the 15x70s, and they lose some attractiveness for that reason. Second, having the SV50 mounted alongside the Apex 127 was like having a high-end binocular I could park. I was using the 23mm eyepiece that came with the scope, so only 8.9x, but I often could see things in the SV50 that I couldn’t see in the 10x50s, so as the evening wore on I gravitated more and more to using the SV50 and skipping the bins entirely. I’m super-happy with the tandem scope setup; it is working out exactly as I’d hoped. Not-quite-finally, I’m sorry to those of you who have commented or emailed lately and not gotten a response. Paleontology has kept me cuh-ray-zee busy this spring, as it did last spring–my coauthor Mike Taylor and I had a paper published last month (free to read here), we have another due out any day now, and we have two more due to the publisher at the end of this month. So that’s where I’ve been. I am sorry for going so completely AWOL and especially for falling behind on my correspondence. If you’re a regular, thanks for not giving up on 10MA while I’ve been on hiatus (and if you’re new here, welcome, and expect periodic delays!). Really finally, there’s a new addition to the blogroll on the sidebar. The Thwarted Astronomer is the stargazing blog of my friend Fiona Taylor (spouse of the Mike Taylor I do dinosaur research with and blog with), who lives in England, in the village of Ruardean, near the border of Wales. I have been to Ruardean to visit Fiona and Mike many times, and I can attest that their skies are freaking amazing, when (operative bit) there are no clouds. Which is not often. So, long story short, Fiona has caught the astronomy bug, but the lack of observing opportunities is getting her down. Since we have some regulars here who probably have it even worse, like Doug Rennie up in Oregon, I was hoping maybe y’all could cheer her up. All right, that’s it for now. See you back here before another month is up, I promise. You are currently browsing the 10 Minute Astronomy blog archives for the day Monday, March 11th, 2013.